Sorry to inform you that The Budapest Sun, fortnightly magazin ceased. The remaining money of the valid subscription is going to be transfered back to the accounts of our subscribers. 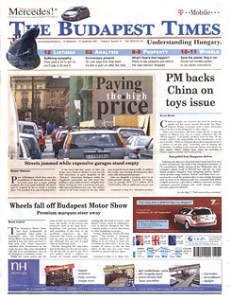 Alternatively we offer you to subscribe for a similar but weekly title, called The Budapest Times. The price of one issue is HUF 750. One year subscription is HUF 39.000. Click here to subscribe directly!